If it’s just for your kids grade, I don’t care. If you want to cheat them out of learning how to do stuff on their own, go for it. But when it’s a contest that my kid is in, please don’t as a parent compete against my kid. We all know that the work of even a very bright five-year-old is quite different than the work of a 38-year-old. You aren’t kidding anyone, and you are making a lot of kids sad because they don’t stand a chance against the 30 years of life experience and school projects that you have on them. The infamous grocery store express lane. I am behind you counting your items. Twice to double check. If you are over the limit, I am looking you over and making a judgement. Deciding how much grace I want to show you in my mind. Was it close and you really miscounted? Did you bring three small children with you and getting in the express lane was a desperate panic move? Is it legitimately possible that you can’t read? If you’ve gotten in the line with enough items over the limit that I have time to exhaust and consider all of these options before it’s my turn, then I’ve probably moved to unkind and judgmental thoughts of you. Because you are breaking the rules. The check-out lanes at Ross. They truly perplex me. Have you noticed that there is one line that says “Returns and Exchanges” and one line that says “Purchases”. If not, well let me just say that clearly most of the people shopping there have not either. I am constantly walking through the “Purchase” line only to have someone walk through the “Returns and Exchanges” line to go ahead of me and make a purchase. Ross, what are you trying to do here? It isn’t working. Getting in the turn lane early behind me. I go with the lines on the road, unless there are cars sitting in the turn lane that go back further than the lines. If you are behind me and going to turn, you need to wait to see if I get in the turn lane rather than getting in there before I can. This really messes with my driving anxiety. Children’s races or events with age restrictions. All the kids 10 and under run out there. We live in the same small town and we all know how old your kid is. And if we don’t, we all see that your kid who is 2-heads taller and growing facial hair is not under 10. When he wins, I hope you are proud as you see all the small children that had no chance to win the prize and left crying. If only everyone could be a rule follower like me. What is a rule that it drives you crazy for others to break? 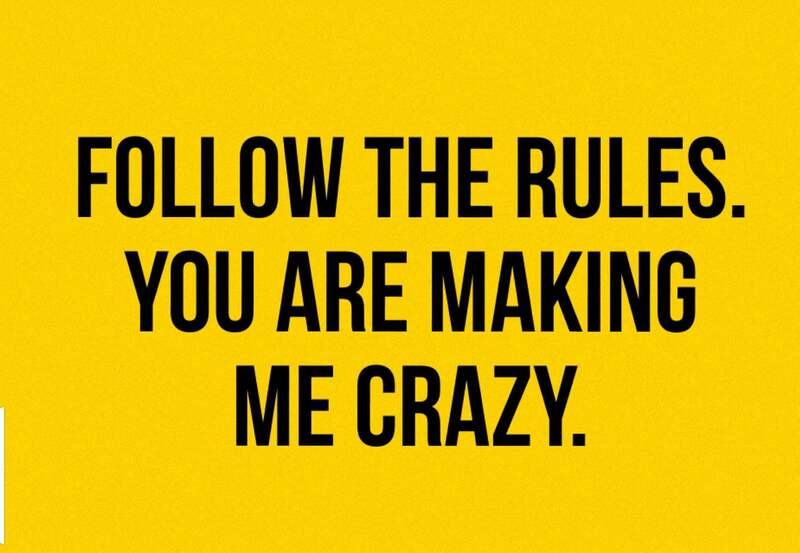 What rule makes me crazy? When someone orders a soda (that has free refills) and their spouse orders water, and then they share the soda — Lots of times!Or getting water and a zillion lemons and adding sugar to it…guess what! That is called lemonade, folks! Oh, I bar you see that all the time! Yea, not cool.